CHILOQUIN, Ore. — Water users in a small Klamath County irrigation district will benefit from a cooperative project that will lead to the removal of the Chiloquin Dam. The first phase of the $9 million project involves the construction of a new main pumping plant along the Williamson River near Chiloquin. The pumping plant, which includes a series of seven fish screens and a temporary river-diverting wall, is the visible part of the larger dam-removal project. The long-range goal of the dam removal is to improve passage for two species of endangered suckers — Lost River and shortnose — so they can access 80 miles of historical spawning habitat in the Sprague River watershed. The work along the Williamson is intended to ensure water users with the Modoc Point Irrigation District, which owns the dam, can continue to irrigate about 5,200 acres of land mostly used for livestock grazing. LEE JUILLERAT For the Capital Press. Crews work on a new main pumping plant along the Williamson River. “I think it’s beneficial for us, and we’re helping to save the suckers. It’s a win-win situation,” said Pete Bourdet, an irrigation district member who helped negotiate the settlement between the district and the Bureau of Reclamation and Bureau of Indian Affairs. The district has enjoyed free use of irrigation water since 1954, when the Klamath Tribe was terminated and the district took ownership. The dam, built in 1914, diverts water into a gravity-flow canal alongside the Sprague and Williamson rivers that carries water during the May 1-Sept. 30 irrigation season. In recent decades, scientists have determined the dam seriously limits passage of native fish species, including suckers and redband trout. Efforts to remove the dam required negotiations with irrigation district leaders. “We don’t have high-income crops. We are basically pasture and hay,” Bourdet said, noting the land is not used for row crops. “We can’t afford to pay as much for water” as farmers who grow potatoes and alfalfa. “We’re just wanting to remain whole,” said Linda Long- Bourdet, who worked as a liaison between the district and attorneys. She said the settlement includes a $2.45 million payment the district will use to offset pumping costs and to pay for a plant manager and for pumping station repairs and maintenance. Chuck Korson, dam removal project director for Reclamation’s Klamath Basin Area Office, said the project shows what can be done when groups work together. 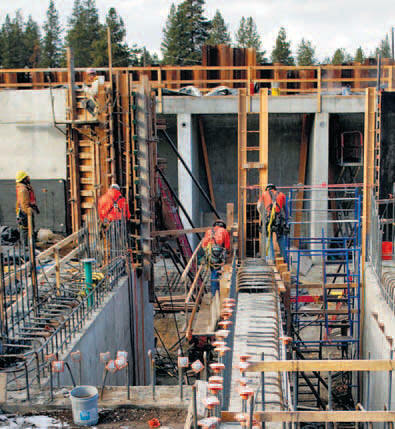 “It’s been a real good project in the sense we have a lot of stakeholders involved,” Korson said, noting the cooperation by the irrigation district, Reclamation, the Bureau of Indian Affairs and various local and federal agencies, including the city of Chiloquin, Klamath Tribes, U.S. Fish and Wildlife Service and Forest Service. Randy Wyatt, Reclamation’s part-time field manager, said the project is on schedule for completion by April 2008. The plant will be tested for two months and, if it meets approval, removal of the Chiloquin Dam will begin in July with completion by December. Wyatt had praise for Slayden Construction Group of Stayton, Ore., the project contractor, and was optimistic the project will be completed on schedule. “Things are looking good,” Wyatt said. Information: To read the full report, go to www.nationalacademies.org and click on the link that reads “Big Picture of Klamath Needed for Research, Management,” or call 800-624-6242. Chiloquin Dam history The Chiloquin Dam was built in 1914 to channel water from the Sprague River to water users along the Sprague and Williamson rivers. Built by Bureau of Indian Service, a predecessor to the Bureau of Indian Affairs, it is used for irrigation diversion, not for power generation or flood control. Chuck Korson of the Bureau of Reclamation said the intent was to allow Indians on the Klamath Indian Reservation to irrigate lands and become self-sufficient. When the tribe was terminated in 1954, ownership was transferred to the Modoc Point Irrigation District. The district has about 87 water users who irrigate about 5,200 acres of mostly pasturelands. The dam — 21 feet high and 220 feet long — is less than mile upstream from the Sprague River’s confluence with the Williamson River. The $9 million project is funded by the BIA. Reclamation is responsible for the engineering design and construction management. A series of fish-friendly screens will prevent juvenile, subadult and adult suckers and other native fish from being trapped in the main pumping plant along the Williamson River.